Scientists have received and are analysing the final data gathered by SMART-1 on 2 September, prior to today's Moon impact. This update presents several of the images received, as well as additional images and information from the worldwide ground observation campaign. The seven AMIE images included in this update article were taken on 2 September by the AMIE camera on board SMART-1 during the last few orbits prior to Moon impact. They were taken between 15:19 - 17:34 CEST (17:19 - 19:34 UT) and were analysed by camera scientists during the night of 2-3 September. The images include both oblique and nadir (vertical) views, with the camera pointing mode having been selected to best exploit the illumination conditions during the final orbits over the Moon's night side. In several of the images, the Moon's horizon can clearly been seen; excellent details of the surface are also visible. An impressive sequence of impact images was captured by the Canada-France-Hawaii Telescope (CFHT), a 3.6-meter optical/infrared telescope located atop the summit of Mauna Kea, a 4200-meter volcano on Hawaii's Big Island (see before, during, after image sequence below). The CFHT observed the projected impact area between 07:00 - 08:44 CEST (05:00 06:44 UT), and astronomers were rewarded with a beautiful image of that indicates a very short impact flash, possibly lasting less than a second. While still to be confirmed, a preliminary assessment indicates the impact flash was possibly caused by thermal emission from the impact itself or by the release of spacecraft volatiles, such as the small amount of hydrazine fuel remaining on board. "It was exciting to see the impact flash live from Hawaii, just after receiving, at ESOC, the last radio signal from SMART-1," said Prof. Pascale Ehrenfreund, from Leiden University, Impact Ground Campaign Coordinator. Many other observatories, including both professional and amateurs sky watchers, also participated in ground observation activities. "We look forward to collecting worldwide reports from this impact. We call upon the community to search for the ejecta blankets and for future lunar orbiters to search for the SMART-1 crater," says Bernard H. Foing, ESA's SMART-1 Project Scientist. Their updates will be published on the ESA portal as they are received in the coming days. SMART-1 was also observed by a network of five cooperating radio telescopes over several months leading up to Moon impact. The observatories' activities are coordinated by the Joint Institute for Very Long Baseline Interferometry (JIVE), hosted by ASTRON (the Netherlands Foundation for Research in Astronomy), Dwingeloo, The Netherlands. The participating observatories are capable of making highly sensitive observations, characterized by very accurate timing and the ability to detect very weak radio signals. Starting in the spring of 2006, the cooperating telescopes observed radio signals emitted by SMART-1 and reflected from the Moon as part of a programme to test and validate the very long baseline interferometry (VLBI) technique. 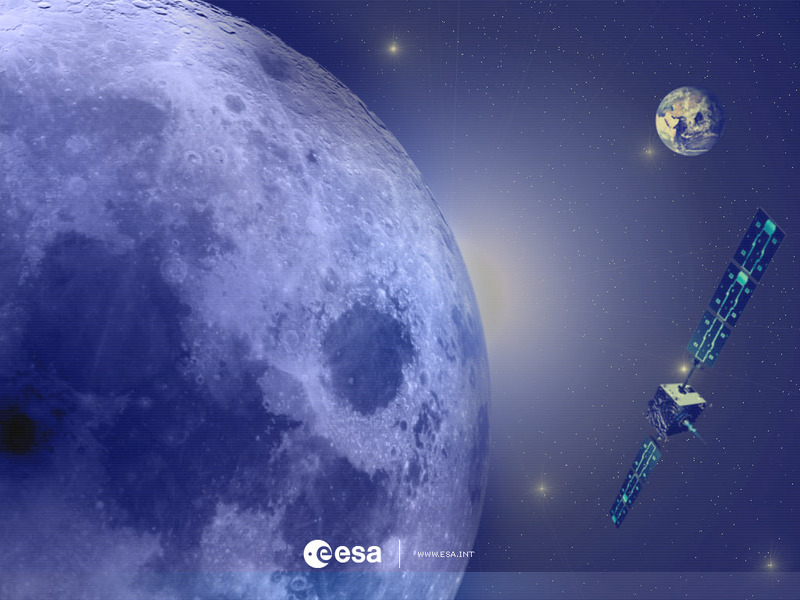 VLBI allows ground-based telescopes to track spacecraft with very high accuracy, and furthermore has applications in radio astronomy, including the testing of radio wave propagation in the vicinity of massive bodies like the Moon and the study of the Moon's surface physical properties. In working with SMART-1, the radio telescopes applied the same techniques used by ground telescopes to track the descent of ESA's Huygens probe to the surface of Saturn's moon Titan in January 2005. This technique is also expected to be used in tracking China's Chang'e-series of Moon missions, to be launched starting in 2007. These and other SMART-1 data will be analysed by the science teams in the coming days and the ESA Portal plans to publish results as soon as they are available. The five radio telescopes involved in the SMART-1 observations and coordinated by the Joint Institute for VLBI (Very Long Baseline Interferometry) in Europe (JIVE), are: the Medicina (INAF) 32- metre antenna in Italy, the Fortaleza (ROEN) 14-metre antenna in Brazil, the German-Chilean TIGO (BKG) 6-metre antenna in Chile, the Mount Pleasant Observatory of the University of Tasmania (Australia) and the Australia Telescope Compact Array (CSIRO). The SMART-1 impact observation campaign involved several amateur and professional astronomers all around the world. They include: the South African Large Telescope (SALT), the Calar Alto observatory in Andalucia, Spain, the ESA Optical Ground Station (OGS) at Tenerife, Spain, the TNG telescope in La Palma, Canary Islands, Spain, the CEA Cariri observatory in Brazil, the Argentina National Telescope, the Florida Tech Robotic telescopes, US telescopes, NASA IRTF, the Canada-France-Hawaii Telescope, the Japanese Subaru Auxiliary telescopes on Hawaii, and many others.